Brookline artist Janet Echelman’s sculpture, “As If It Were Already Here,” will be taken down in October. Chances are if you were anywhere near the Rose Kennedy Greenway this summer, you looked up, saw this colorful, pink and blue and greenish floating structure against the blue sky, pulled out your phone and snapped a picture. Maybe even posted it to Facebook. 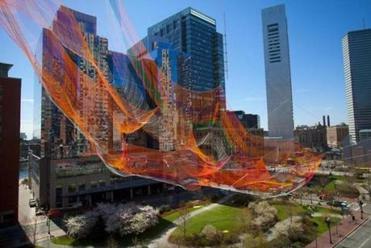 Now the Greenway wants to see the best of those photos, and award the winner of its contest $1,000, before taking down Brookline artist Janet Echelman’s sculpture, “As If It Were Already Here,” in October. If Google Images is any indication, competition could be fierce. The collection of pictures there is stunning. “It’s basically a spider web — a stiff spider web that’s cast between supporting buildings, and it’s the spider web that is holding her sculptural net,” said Patrick McCafferty, a structural engineer at Arup, the engineering firm Echelman works with to design her creations. Constructed of high-tech rope that is eight times stronger than steel, the web takes a shape that is largely determined by the surrounding built environment, including which buildings have excess load-bearing strength. The contest rules are pretty simple. The Greenway and Studio Echelman are asking people to submit photos, either digital, or high-qualilty scans, and be eligible for a series of prizes. 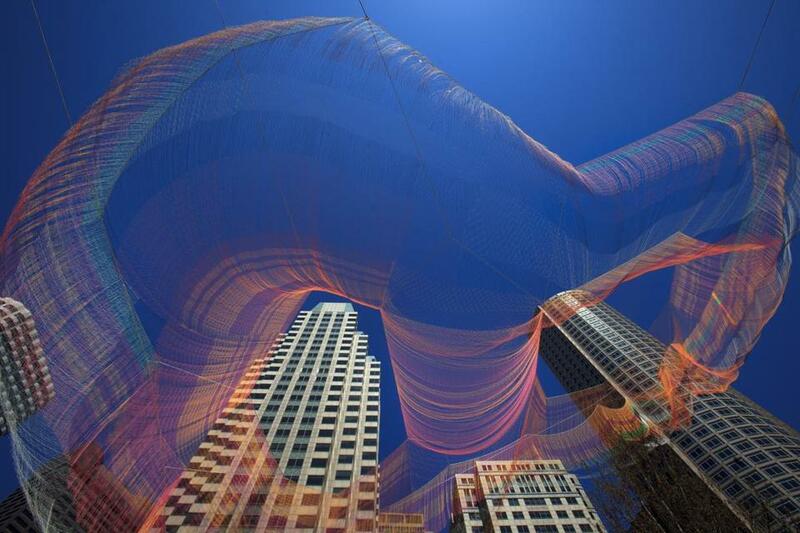 First place is $1,000, and the photo will appear on the websites of Echelman and the Greenway. Second place will be able to inscribe a personal message on a paver on the Greenway’s “Mother’s Walk” next spring. Third place will get a grab bag of goodies, including 20 free rides on the Greenway Carousel. There will also be a number of honorable mentions awarded. The vast, half-acre net of rusty orange, magenta, and green hues will float above the Greenway until October. The Greenway and Studio Echelman are sponsoring a photography contest of As If It Were Already Here, Janet Echelman’s monumental aerial sculpture over The Greenway’s Fort Point Channel Park. Submit your photos according to the rules below and you could be eligible to win up to $1,000! As If It Were Already Here has easily become the most photographed – and Instagrammed – piece of public art in Boston in several years. We are now hoping to feature the ‘Best of the Best’ pictures of this stunning sculpture. For more of the rules and for the complete process, click here.